Please show your passport. 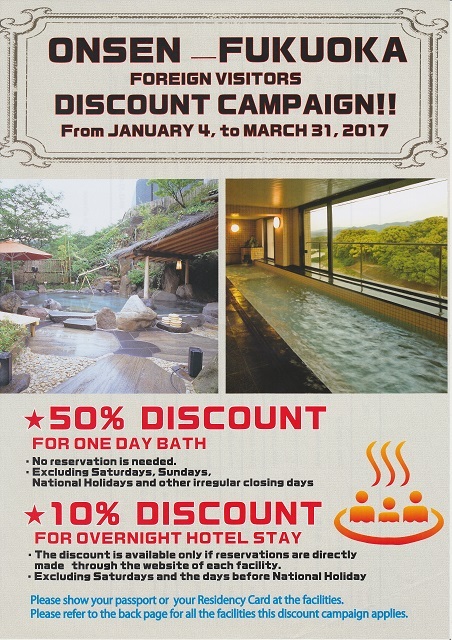 You can use one-day bath(50%discount) and overnaight hotel stay(10%discount) at Koibotal hot spa or Grandhotel Higuchiken from January 4 to March 31,2017. Take care for excluding Saturdays and other holidays. Copyright© Chikugo city Tourism Association All Rights Reserved.